Once a month Parish Council members meet to consider, discuss and decide on matters pertaining to our community. Regular attendance to Divine Liturgy and monthly meetings is required. This ministry includes; Monthly Orthodox Discussion Group, Bi-weekly Orthodox Men’s Fellowship Breakfast, Women’s Spiritual Study Group and various seminars and philanthropic efforts. The goals of this ministry are to enrich our spiritual growth and to increase our awareness of our Orthodox faith. Topics of discussion include aspects of the Orthodox Fait, understanding the Bible, and how these apply to our daily lives. All parishioners young and old, are encouraged to participate. Choir sings during Sunday services from September to June. During Holy Week, the choir leads the congregation in the singing of hymns. It is wonderful to hear the angelic voices of our youth as well as our many talented adults. It does take a certain amount of dedication and commitment to join, but the satisfaction is enormous. Choir members praise God during our Divine Liturgy and are giving a pleasant experience to all the parishioners. If you are interested in taking part in our Saint Andrew Choir, please call the c office, for rehearsal times. All children attending Pre K through High School are invited every Sunday from September through June to attend Sunday school at St. Andrew. Please contact the church office for Registration Forms. For more information about the curriculum or volunteering to teach our children please contact Fr. John. All boys in the parish, 3rd grade and older, may serve as an Altar Boy. Altar boys must be on time each Sunday and take part at the special services throughout the year. If your son wishes to participate in the duties and responsibilities of Alter Boy, please speak with Fr. John. Mazi Class: Thursday Morning, Toddlers to Pre-K - The children are taught colors, numbers, different shapes, nursery songs all in Greek in an atmosphere that is safe and fun. HAS Hellenic Afternoon School: Kindergarten to 6th Grade using the text books and work books the children are also encouraged to speak Greek in class amongst themselves as well as at home with their family. A Preparatory class for the "Consulate General's Examinations" is offered to students over the age of 12 who have completed grade 6 or the equivalent. Adult Education - Greek Language This course focuses on the beginning fundamentals of communicating in Modern Greek. Alphabet, pronunciation and elemental vocabulary are taught while students develop basic skills in listening, speaking, reading and writing. Please call for more information. Senior Group: An advanced dance group for GOYA members that stresses commitment, enthusiasm, team work and peer mentoring. Members are taught various regional dances from Greece and the Hellenic diaspora. The group performs at Metropolis-wide competitions as well as, Sights and Sounds and festivals. The group meets weekly through the school year. Junior Group: Children up to age 11 participate in this fun gathering for the development of Greek dancing skills. There are multiple levels that meet for 45 minute sessions, with up to 3 session per evening. The sessions are led by a talented instructor who has taught Greed dancing for many years in various Greek communities in Northern NJ. For more information contact the church office. The Hellenic Orthodox Primary Education (HOPE) is the ministry to Kindergarten through 2nd grade children. Since HOPE is a ministry, the orientation and implementation of the program should reflect the Orthodox Christian Faith, Tradition and Life. The Greek Orthodox Youth of America, or GOYA, is the ministry to teenagers. Since GOYA is ministry, the orientation and implementation of the program should reflect the Orthodox Christian Faith, Tradition and Life. GOYA is ministry to middle and high school grade Orthodox Christian teenagers. Teenagers should be in sixth through twelfth grades to participate. It is recommended that GOYA ministry be divided into two distinct groups, the junior high GOYA ministry and the high school GOYA ministry. 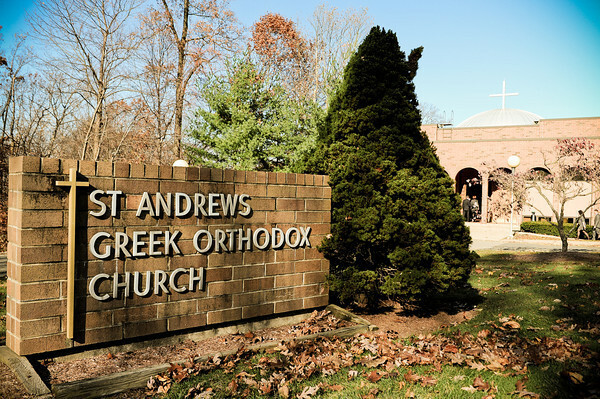 The Philoptochos Society of Saint Andrew is part of the Greek Orthodox Ladies Philoptochos Society, Inc., the duly accredited women's philanthropic society of the Greek Orthodox Archdiocese of America. The literal translation of the word Philoptochos is 'Friend of the Poor'. Our mission is twofold. We strive to(a)indiscriminately assist those in need, whether it is locally, nationally or globally and (b) to promote the Greek Orthodox faith and traditions. Through various fundraisers we raise the resources needed for our charitable work and the growth of our own community. We also find the time to have fun and socialize. The work is fun and the rewards are many. This Group is comprised of the very special people in our community who have reached their golden years. We meet every second Monday, September through June at 11:30AM at the church hall. Everyone gathers for fellowship and for lunch which is prepared by various talented parishioners. An offering basket is available. During the year we have monthly luncheons usually with some information or activity of interest. The members go to dinner theatres, movies, trips to the monastery, visits to St. Michael's Home in New York and other places of interest to the group. We are in constant search of new ideas for activities. Agape sponsors several coffee hours a year and donates to the church's needs and towards Development. All are welcomed to join our Saint Andrew Agape Family for lunch, there is no membership fee. DAUGHTERS OF PENELOPE - Alexander #250. This is the family which stands for American Hellenic Progressive Association. Both AHEPA and the Daughters strive to keep their Hellenic culture and spirit alive but at the same time they are involved and support many projects in their communities both locally and nationally. They are leaders in philanthropic, educational and cultural activities with local chapters in the United States, Canada and Greece. Their objectives are to promote the social, ethical and intellectual interests of its members and to preserve the ideals and traditions of Hellenism as a contribution to the development of America. Every year they award numerous scholarships to High School Seniors going on to college or university.